Navajo Nation Presidential candidate Chris Deschene greets the attending audience at the Window Rock Sports Center in Window Rock as the Navajo Nation primary elections begin to wind down. 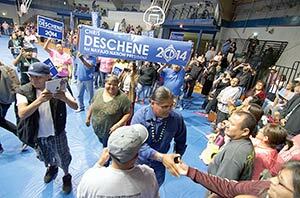 Deschene got the second most votes, 9,734, after Joe Shirley Jr.
Those were the words and chants coming from supporters of Navajo Nation Presidential Candidate Chris Deschene, who held blue and white campaign signs and cowbells, as their 42-year-old presidential hopeful entered the Window Rock Sports Center Tuesday night. Deschene, of LeChee, Ariz., came in second during the 2014 Navajo Nation Primary, meaning that he will faceoff with Joe Shirley Jr. during the general election in November. Deschene won 19 percent, or 9,734, of the unofficial primary votes, while Shirley secured a 21 percent tally with 10,910 votes.